My old website used Wordpress. 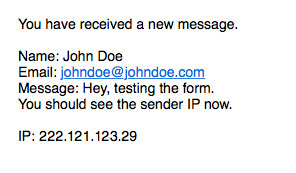 There is the contact form contained the user IP address information too. I’m curious, it is possible in Blocs? When somebody send me a message through the contact form, I would like to know those IP address. When somebody visited a page, or click a button on my website would send me an e-mail notification. Maybe with the user IP address. After you’ve exported your site open the file “form_1.php” in the “includes” folder. Now you should get the IP in the receiving mail like this. Your #2 question doesn’t sound like a good idea. Better to use google analytics and get statistics that way. I did it, but doesn’t working for me. The line “IP:” is empty. The forum removed two underscores in the code. Just put them back like in this image and it should be OK.
@Norm: Please build it into the next version. Simple but great and helpful information. Only plus 30 characters. Thanks in advance. @Norm request for reCAPTCHA as well. Ben you could either just have a patched file ready when needed. Or… “probably not Norms choice” but you could add it to Blocs app and it would get exported each time. We don’t want to mess up Blocs. @Norm: What about my request? I trust in you positive judgment. Sorry, it has not been requested enough, maybe if 20 or 30 more users request it. I currently have other priorities with forms such as recapture and SMTP posting. This thread contains all you need to edit the posting script after export. It’s a very specific requirement I don’t think the majority of uses require at the moment. If anybody wants this function, please push the like button. Personally i think forms look good on a page but i prefer a regular mail. In a form people can accidentally type their email wrong and you can’t reply them. Or just put any mail for the fun of it, or use a VPN or fill the form from any place with wi-fi and so on. If someone is serious and would like to get in contact they don’t mind using a regular mail link/button as they probably use regular mail daily. Meanwhile if you still want this function just keep a patched file ready and upload/replace it when you publish. I can do it. Even though I’m a designer, not a programmer. I already have a list, post-export modifications. It is currently approx 15 minutes. Every time I change something on my site. I already have a list, post-export modifications.It is currently approx 15 minutes. I’d love to see the list. You may be doing things others might want to see as part of blocsapp. Yes I’d like to see that too. The PHP file addition is the first on my list. Hello, couple days late but, figured I would chime in on this one. There are several issues that can arise with the mail to link. Its not compatible with every mail client for start, I couldn’t imagine testing a link in every mail client, bet there are a few, most will typically launch the client, typically something gets left out, maybe the subject in Outlook, or Cc in Gmail, Thunder Bird, whatever. A form sends those variables (message, subject, to) via a POST request, its far safer because its not stored in the browser cache, what if the message contained privileged info, anybody can see it . And lastly, this is my favorite btw, browser bots, more so email harvesting, its an awesome way to get spam, junk, malicious material, and once one gets that address, its for sale. Almost ruin an email account. Anyways, to each is own, they both work, but thats why forms are the industry standard. Cheers!